Patently Apple is reporting a new patent filed by Apple. 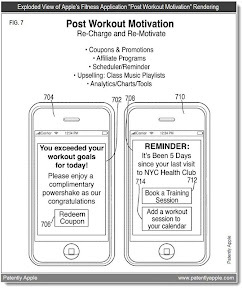 On April 28, 2011, the US Patent & Trademark Office published a patent application from Apple that reveals various aspects of a newly advanced Fitness Center App that they've been working on for some time now. 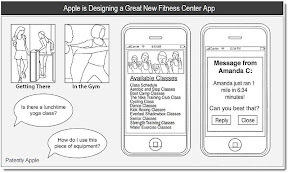 While Apple's app is uniquely their own, they appear to be consulting with or at least including Nike into their program as one illustration lists "The Nike Training Club Class." Apple's Fitness Center App is well designed to cover all aspects of a workout including stats gathered from next generation smart equipment right down to the inclusion of a unique social networking component that will work within a particular fitness center or within your city limits to help you find a workout buddy and/or to stir on competition to get you motivated. Apple's new fitness center app is designed to work with your iPhone or iPod touch to provide you with realtime stats to keep you informed and on track. This potential new app does combine multiple new retires from Apple. Apple incorporates social network, NFC, voice search etc, in order that this app is successful. If Apple is really building an app like this, then it might be very likely that this app is a part of the new iPhone or even a totally new device to replace the iPod which suffers in sale since the arrival of the iPhone. It is very likely that Apple will have deals with all major fitness centers chains like they have with the music labels. It would make totally sense and would instantly put hundreds of fitness apps out of business. All fitness apps, I saw so far, were self contained and did not work in combination with existing fitness equipment in the gym. I do work out at least 3 times of the week and use my iPhone to keep track and to listen to music. But to keep track of my diet and work out is painful and many times I can't remember what exactly I did. The only accurate data I have, is my running, because of the Nike plus device. It would be great if I could measure my pulse like with my pulsar watch or to record the calorie burn when I ride the spinning bike. I am just wondering how free weights would work with this app. Maybe they all have small RFIDs attached and the iPhone would recognize how often i press how much pounds. This would be perfect. With the app the user can search fitness clubs by talking to the phone. The user can see who of their friends are working out and exchange tips through the apple social network. The app will have a point system to encourage the user to do more work out.